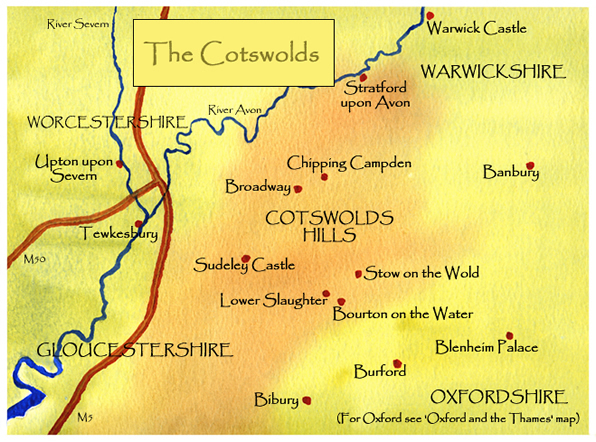 From Oxford I regularly visited the Cotswolds - that wonderful Cotswold Stone again, and many river scenes. I love the Shakespeare country around Stratford upon Avon with its thatched cottages such as Anne Hathaway's cottage, Hall's Croft, Mary Arden's house and Shakespeare's birthplace. Blenheim Palace, reflected in its lake is a real challenge, and the wonderful little villages with cobbled streets and bridges such as Bourton-on-the-Water and Bibury are all so individual, and fun to paint.